We spent last night in a newly renovated Holiday Inn Express. Breakfast was included, chaotic (the reno is not complete), but overall pretty decent for cold breakfast. It was difficult to tear ourselves away from a private room with working wifi and soft beds, so we didn’t leave the hotel until after 11. 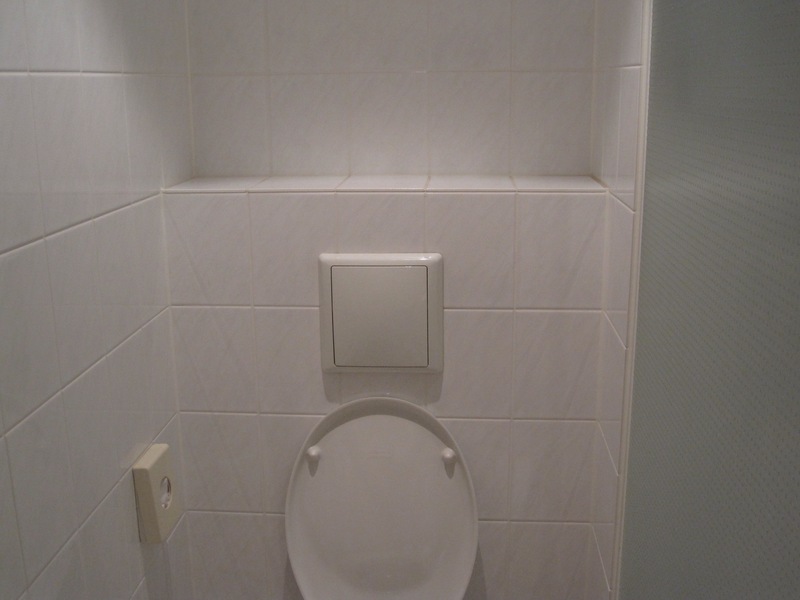 The other notable feature of this hotel was the world’s largest flush button. 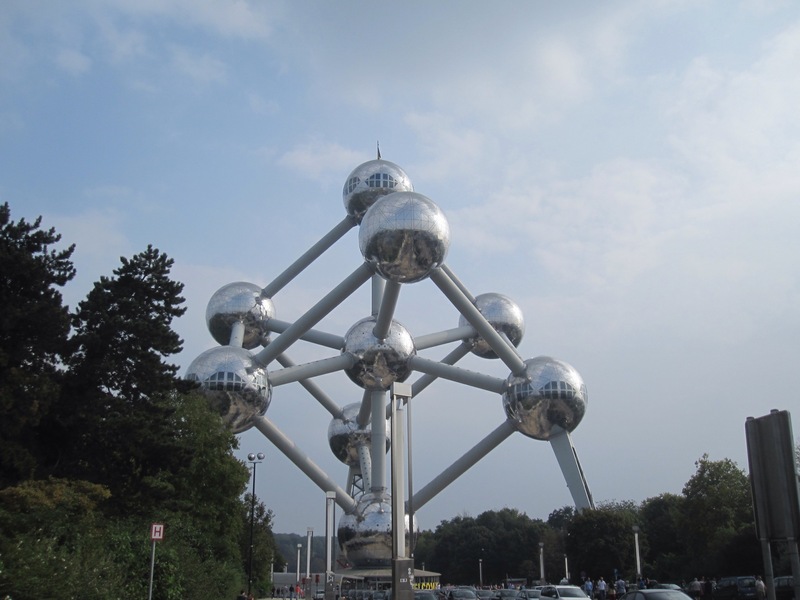 After getting slightly situated, I suggested that we make a trip out to the Atomium, since this would be our only day in Brussels. We first needed to buy our train tickets to Strasbourg, but fortunately this could be accomplished at the same station from which we would leave for the Atomium. Tickets bought, we purchased round-trip Metro tickets (credit card did not work at the ticket machines–whether this is an issue seems to vary from country to country), figured out how to validate our tickets, and boarded a train. We switched to another line, then found ourselves retracing some of the route we had taken into the city. At the end of the line (where our Use It map had indicated we should find the Atomium) there were no signs or information of any kind. Hmmm. We climbed up to a bridge across a road and found signs after a bit more walking. 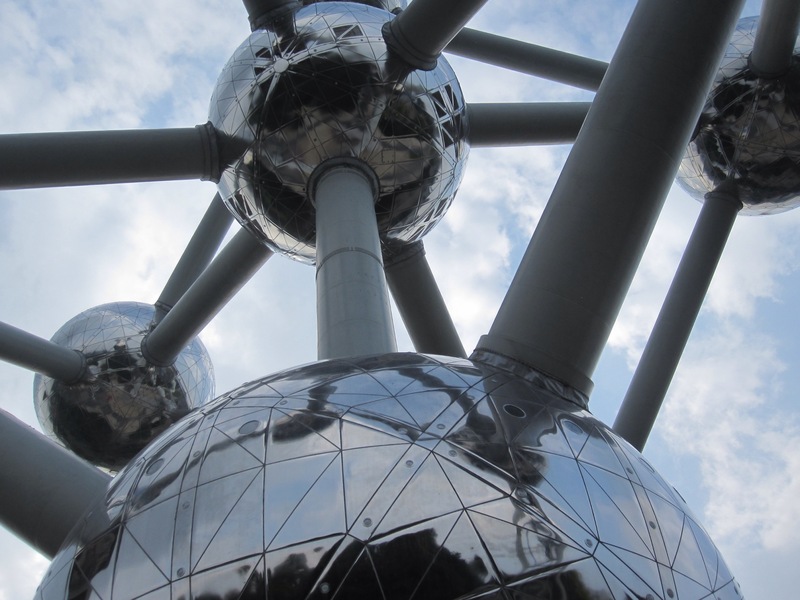 A little additional hiking brought us to the Atomium. For the lateness of the hour (4:30–it closes at 6), it was still quite crowded. We considered paying the 11€ per person to go inside the structure, but after looking at the people queuing for lifts inside, we opted to have a sandwich and enjoy the outside instead. We also determined that there was a closer Metro station. We paused on the way for the day’s best bargain, 1€ ice cream cones (Moka of course) from a truck. We boarded a train and enjoyed the ride back into town. Whereas the ride out had spectacular graffiti along the route, the ride back was highlighted by stations with a great variety of designs. Definitely worth the price of the trip for the art alone. An evening stroll and unremarkable dinner (moules frites for me, definitely mediocre) completed the day. We did visit the Grand Place, but it was filled by a beer festival, so no photographs were taken. Although there were quite a few people, I noted that the festival seemed almost placid compared to similar events in the U.S. I did enjoy the Galeries Royales Saint-Hubert, a shopping arcade (lots of chocolate, watches, gloves, etc.) that dates to the mid-19th century. Tomorrow, back to France–better get another waffle before we go! No waffles at the HI Express, I’m afraid. Boiled eggs, lots of bread varieties (and toppings), cheese, meat, yogurt, and the ubiquitous cappuccino machine. MUCH better than today’s breakfast at the hostel.